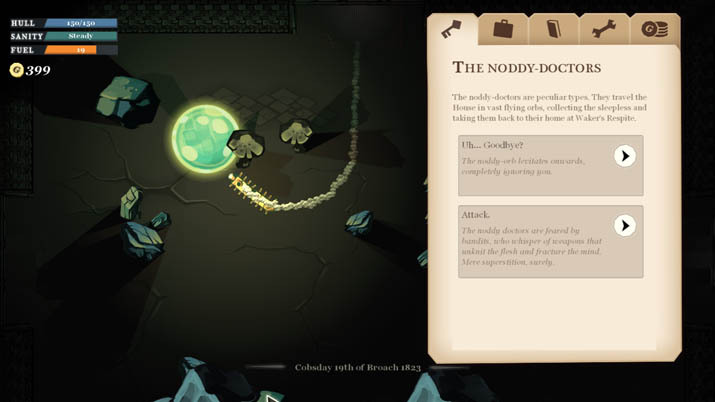 “Story Rich” games are an interesting segment of the gaming industry. An argument could be made that almost every game is story-rich, which is why I have always taken a certain cynical perspective when it comes to games that decide to label themselves as such. I am cynical of the moniker because I feel as though it allows the developers to ignore proper gameplay mechanics, and eschew any obligation to graphics. This mindset rarely prevents me from attempting to play through games in this genre, but I am also rarely proven wrong. A House of Many Doors [Developer/Publisher: Pixel Trickery] is a well-made game, one that erodes the reasoning of my predisposed notions of what the gaming experience is going to be. You begin in darkness, with no sound at first – except for some mechanized noises from your 16-legged train – and a character creation script regarding the theft of your memories. With a soundtrack that feels as though it is straight out of a 1900’s piano parlor playlist, the game opens up into a quest to regain your own thoughts, all the while trying to escape from the dimension in which you are trapped. Visceral gameplay seems to mostly consist of using the WASD keys to move your mechanized train throughout the dark land that surrounds you, trying to get from one square to the next without getting chased down for a battle with, or potentially getting eaten by, monsters hiding in the dark. As you navigate this darkness, you have the option of either keeping your “heartlight” on or turning it off. One of the three metrics that is tracked in this game though is sanity, and it seems as though your sanity is directly affected by the amount of time you spend in the darkness, or the number of actionable events you fail along the way. This is somewhat tedious, as the battle system is difficult and unforgiving, and there doesn’t seem to be a lot to gain outside of just trying to find the next city to see if it is interesting. The story-driven gameplay is a little bit more nuanced, as there is not only a crew that assists you within your journey, but also different character attributes, such as guile, grit, esoterica, spirit, or craft, that make a difference in the story arc. The crew offers some of these attributes to your overall journey, and they can also be interacted with in a relational way, seemingly leading to some potentially unique story shifts along the way. Although the story is unique and well written, mostly in the sense that there was a lot of care put into the language and the backdrop in which you persist, that same care has created a complexity with which it is difficult to identify. To give you a window into the convolution: at one point while travelling through the darkness, I found a well and looked inside. What I found was a “Glimpse into Another World,” which certainly sounds cool, except that I have no idea what it means or how to use it. Ultimately, I sold ‘it’ to a vendor in Founders Fire for enough money to buy more fuel to try and find another town elsewhere. Factor in that, an hour into the game, I had an inventory full of similarly titled things, like a “Primordial Oddity,” an “Unsanctioned Scripture,” or “Occultist Paraphernalia,” and you can start to see a picture of where I lost my way. I had hopes for the battle system, and early on in my adventure I attempted to initiate battle with various sizes and shapes of enemies (usually also in mechanized ships). Not only was I beaten handily, but I also found the combat system to be clunky and unrewarding. The system is structured in a way that saw a lot of success with FTL, a segmented internal ship with crew members that can be moved into different rooms and have specific roles. However, in A House of Many Doors, it is difficult to get the people to move where you want them, and although they have certain roles, like engineer or medic, there don’t seem to be exact actions that can be carried out. Instead, you are left trying to move little guys that are not spaced well into rooms where there is damage, or injured characters, in hopes that proximity alone will solve the problem. Add in the fact that you are essentially firing your single gun at another ship in a turn-based manner until it explodes or you die, and that is the entirety of the system. I personally got the impression that I was better off not fighting at all, so I didn’t. There is a lot to love about this title – no doubt about that. The art is beautiful in its simplicity; while sitting at the town of Gandola, I even thought to myself that if the art was just standalone, it could have easily been a print on a wall somewhere. The musical interplay with the sanity bar is compelling, as the soundtrack gets scratchier and more tense as you shift from steady, to anxious, to unstable. Finally, the story is very well written. It is articulate and defined in its own style to be sure, though the direction feels disjointed, and this ‘disjointed’ feeling inevitably pervades the game as whole. 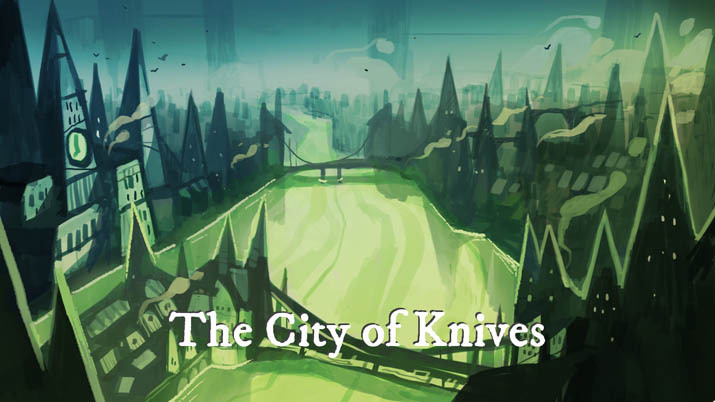 A House of Many Doors is a terrifying trek through the unknown, a disjointed story with startling descriptions of lost memories and slow declines into madness. It is beautiful, haunting, gripping… and boring. It is simply hard to identify with it, and complicated to understand, which prevents it from truly capitalizing on the amazing elements that stand alone so well. It is not a game that should be played with hopes of finding instant enjoyment; instead, it must be dissected piece by piece over many hours. Once you have made it to the core, you can then start to really understand why you even started playing in the first place. Alex Mickle is a gamer that traces his roots to JRPG’s on the PS1, but ultimately found his way to PC gaming by spending every afternoon after school playing Counterstrike at a local LAN gaming café. He is a father and husband that splits his gaming time into bursts whenever he can find time, or when ever he makes time. Alex enjoys variance and versatility in his gaming experiences and can be found asleep on the couch with a twitch steam on the television at the end of almost every night.